Getting easy topspin is something a lot of players struggle with. Especially on the backhand side. But luckily for you, there are several simple, but powerful tips that can unlock that great spin you’ve been looking for. So, let’s take a look at some of them. 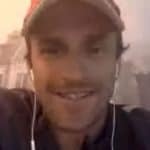 What’s The Best 2 Handed Backhand Grip? When a player comes to me wondering how to get topspin on the 2 handed backhand, one of the first things I look at is their grip. You see, there are a few variations on the two handed backhand grip. And if you want to produce more spin, you can experiment with adjusting your grip so that the bottom hand is in what I call the “strong” continental position. This will make it easier to close your racquet face so that you can brush up the back of the ball. You also can angle your hands, so that the trigger (index) finger is spread, allowing for more feel and play in the hands and wrists. 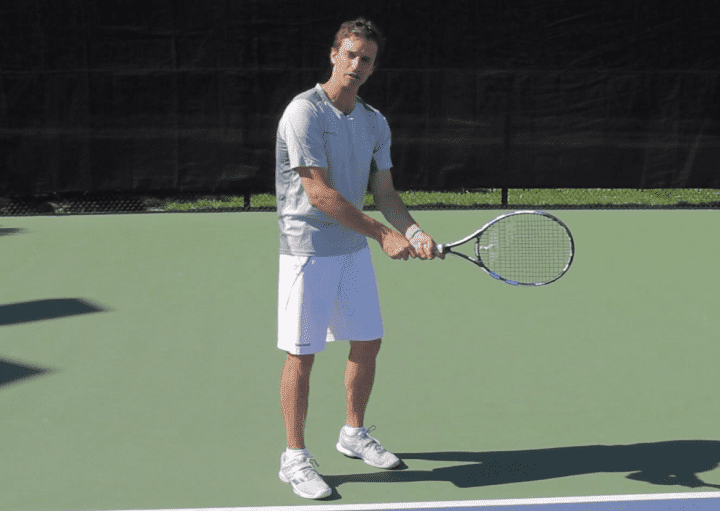 The swing path is another big key to creating easy topspin on your two handed backhand. You want to focus on swinging from low to high. You racquet head needs to drop below the ball. Then, swing from low to high keeping your strings facing the net for as long as possible. This creates the brush up the back of the ball that you want. Make sure to finish high above your shoulder to exaggerate this movement. 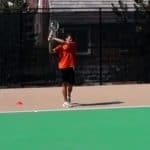 There is a really powerful drill you can do to help you master this topspin swing path on the two handed backhand. Get close to the net or the fence. Face it, and swing up against it. Keep your racquet face up against the fence or net for as long as possible. This is called the Fence Drill or the Net Drill. It teaches you the feeling of keep your strings facing the court for a longer period of time. 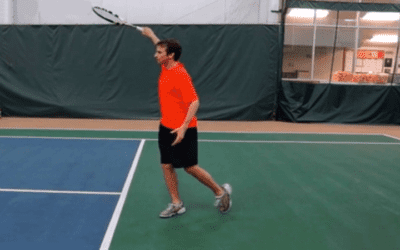 This motion is crucial to producing the easy topspin you want. 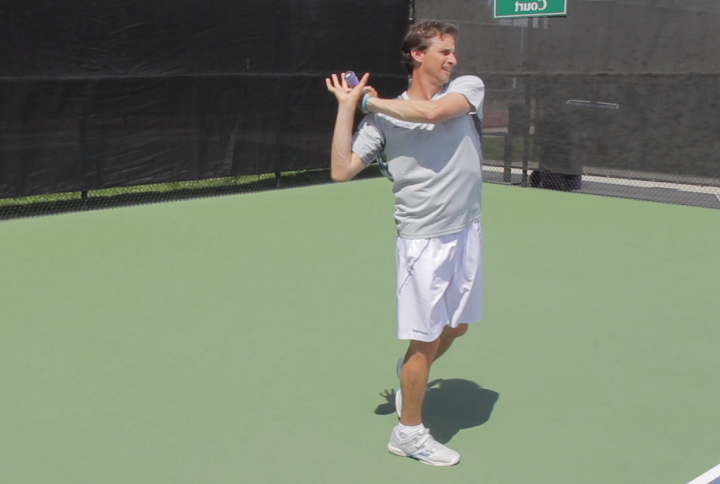 Another great tip to help you create easy topspin involves relaxing your hands at the end of your swing. Relaxation is key to all shots. But this is especially true when you want to hit topspin. If you don’t have loose hands, you won’t be able to produce much rotation on the ball. In order to relax your hands properly, open your fingers at the end of your swing. Hold your finish and open your fingers, letting your racquet dangle more. This will remove all tension from your arms, and help you get that smooth topspin that you’re looking for. If you still can’t figure out how to get topspin on the 2 handed backhand after trying the tips above, give this one a try. This little known tip could be just the trick for unlocking the right feeling required for generating topspin. Keep your weight back when you’re hitting your two handed backhand. If you lean forward too much, you may block your hands from brushing up the back of ball. 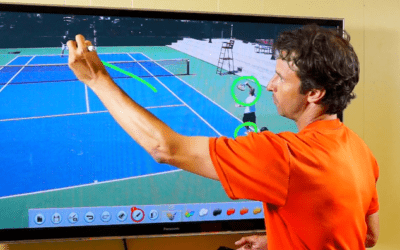 This will prevent you from swinging low to high the way that is most efficient for hitting topspin. 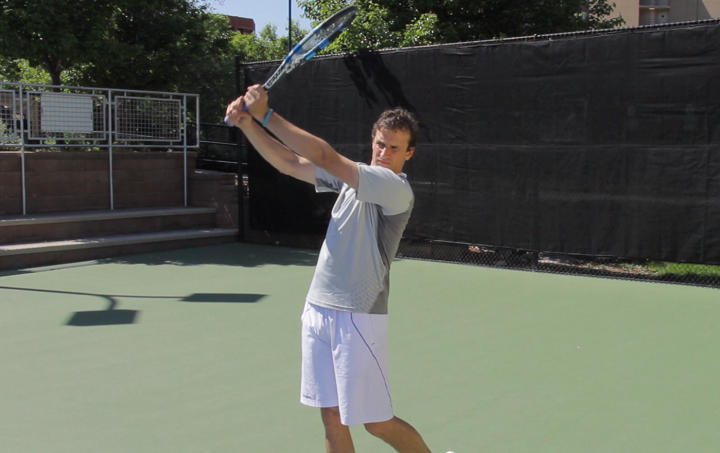 By keeping your body more upright, you’ll be able to swing up properly and create easy topspin. 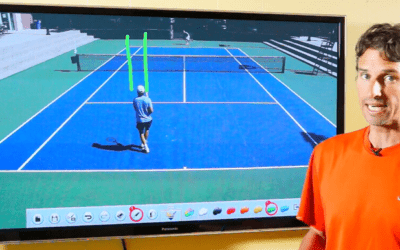 Put these powerful tips on how to get topspin on the 2 handed backhand into practice the next time you’re on the court, and you should be able to fix your backhand topspin problems before you know it.